What is shows is that as the amount of money raised (and deployed) in seed funds has grown over the last ten years, the ability of the companies that received those seed investments to raise a follow-on Series A round has declined (massively). That trend is what you would expect, of course. Supply outstrips demand at some point. But from where I sit, I am having trouble with the magnitude of these numbers. First of all, I don’t think the “conversion” from Seed to Series A was ever in the 80% range. I think it is generally around 50% and moves around that number a fair bit. But I can’t imagine a time when 80% of seed funded companies go on to raise a Series A.
I also don’t think it is now sub 30%. Maybe sub 40%. Maybe not. But I’m having a hard time believing that less than 3 in 10 seed-funded companies go on to raise a Series A. What I think has happened is that there is now a significant “grey area” that has developed in the middle of Seed and Series A. We have “post seed”, or “seed two” rounds. We have “early As”. So the data isn’t clean and it is harder to track from type of round to type of round. I also think a lot of the seeds that were being done back in 2006 were non-institutional and harder to track. 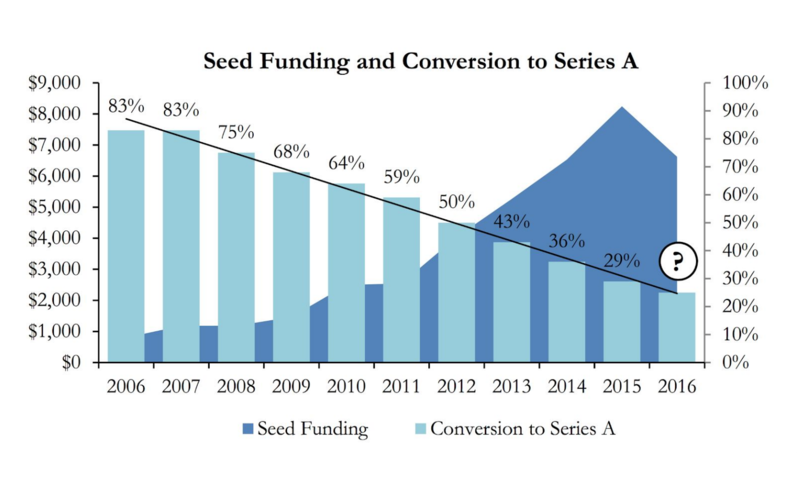 As the seed fund market has exploded in the last ten years, more of the seed rounds are including at least one institution and are now getting tracked in a way they were not in 2010. So, are more companies getting seed funded? Yes. Is a lower percentage of them going on to get Series A rounds? Yes. Has that percentage gone from north of 80% to south of 30% in ten years? No way. There is more Series A money out there too, but it has not grown as quickly as seed money. It is certainly harder to raise a Series A than a Seed. But that has been true for some time.